Finally sharing pictures of the finished neutrals quilt I’ve been working on. 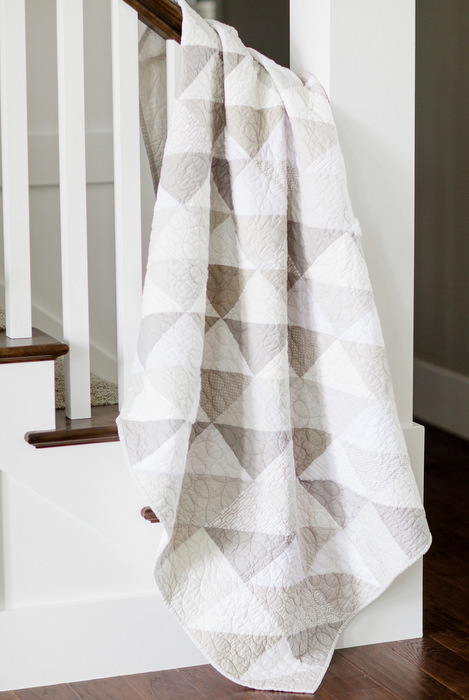 This traditionally styled quilt is made from only shades of white and gray fabrics, giving it a subtle modern feel. The friend who this quilt was for, picked the palette herself. She has a very clean, neutral style and wanted something to complement their gorgeous home. (Where we shot these pictures.) She let me pick the design. Because the palette was so simple, I decided to go with a basic layout to – good old half-square triangles. You can never go wrong with HST’s, I tell you. I originally planned to do a Broken-Dishes layout but once I got the blocks pieced, I tried it and didn’t love it. So I went even more basic with a simple light and dark layout and I LOVE how it turned out. Super simple but effective. A traditional design with a minimalistic color scheme to give it a modern look. You could use any neutral, low-volume/contrast fabric for a quilt like this. We were a little picky about shades. Seriously, who knew how many different shades of white there are! Well, if you’re an avid painter, you know. We were trying to keep all the whites and grays in the same tone. I also looked for fabric with texture- like chenille, linens, and wovens, to give the quilt some depth since the colors were so muted. To create this specific quilt I cut ninety-nine 8″ x 8″ squares. I matched up a ‘light’ and a ‘dark’ square into pairs and used this method for making half-square triangle blocks. I squared-up the blocks to 7 1/2″ x 7 1/2″. Then laid out the blocks 9 across by 11 down for a finished throw-size quilt of 63″ x 77″. And of course, you could make this quilt any size you wanted. Yardage-wise that’s roughly 10 half-yards or 20 quarter-yards (not fat quarters) and 3 3/4 yards for backing. The quilting was done by Melissa of Sew Shabby Quilting. I chose the Loop D Loop design. It was another perfect combination of traditional motif on a slightly larger scale to add to the quilt’s modern feel. I washed this quilt before I handed it off to make it soft and snuggly. I love the way it shrunk (we used 100% cotton batting to help with that) giving the quilt even more texture. I know I wouldn’t have come up with this color palette on my own, but now I’m itching to play with this muted palette again. I’m also happy to report the recipients have loved it. And that’s the reason we do all is cutting up fabric and sewing it back together, isn’t it? Linking up to the Blogger’s Quilt festival and Finish It up Friday! Absolutely love it! Very much on trend and a nice change from brighter, multi-colour quilts. Super work! That is just beautiful! Very classy. I haven’t spent enough time making HSTs, but this is very inspiring. I have two quilts in the queue, then I’m working on organizing stash. That seems like a good time to make lots HST! Did you use a larger ruler than the 6-1/2 inch to square up the 7-1/2 inch blocks? The quilt is beautiful and the photos look like a magazine! I did. I used an 8 1/2″ ruler. I also used a friend’s large Eleanor Burns Quilt in Day Half Square Triangle square-up for many of them. Makes it go so fast! Was your HST 8-1/2″? Is that what you meant by 8-1/2″ ruler? Wow! What an impressive result! Great job selecting the color tones. I’ll bet those different textures really add to the quilt too. Love, Love, Love!!! Just gorgeous!! So beautiful! I’ve been waiting to see this final product 🙂 And your final sentence – “and that’s why we do all this cutting up fabric and sewing it back together” – brilliant! Never thought of it quite that way, but that’s pretty much what it is, isn’t it! I kind of want to do a monochromatic quilt like this now, but maybe with sea glass colors! Absolutely love it! I am going to start collecting my neutrals so I can make one just like it. I’m not a huge fan of patterns. This would be so pretty in my house. 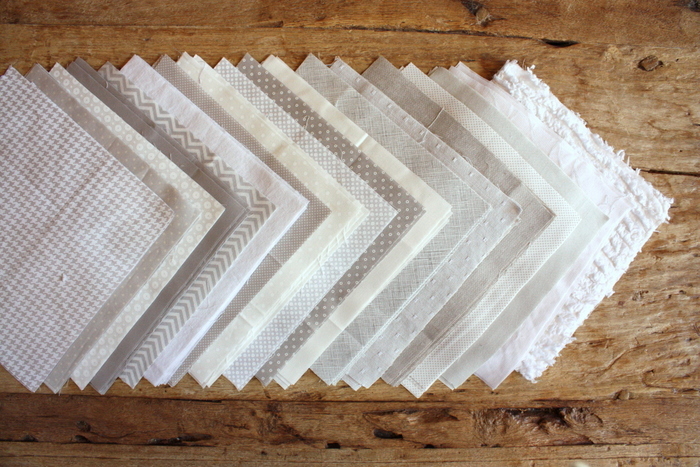 Thanks for sharing….I’ve been waiting ever since you first posted you were doing a neutrals quilt. It’s beautiful. Love the fabric with the textured lines, where did you find that fabric? I would love to have some like it to try my won neutral quilt. I found it at my local quilt shop. I can’t remember the brand though – (and there’s no selvage since it’s a woven.) I’ll look again next time I go and let you know! I found them. Those fabrics are from Diamond Textiles and are part of the Primitive Homespun collection. Such a gorgeous, calm quilt — love it! Beautiful! I don’t know I would ever think to try this color palette either, but now I might. Well done! Just curious if you use any special laundry detergent when you wash your completed quilts? 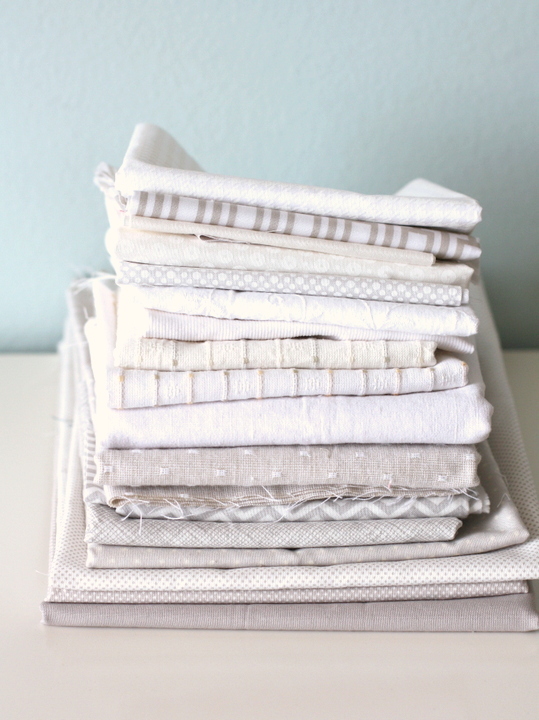 I try and use a mild detergent when I wash quilts and very little – especially if it’s the first time. There’s a specialty detergent called Quilt Care that I’ve used on delicate quilts before. that ‘modern’ means neutered. Modern is a celebration of color and ,yes, neutrals can and should be a support or backdrop. So perhaps your negative toned comment and opinion that color/fun IS modern quilting…shouldn’t be included in a comment on a persons personal blog about her own personal style and art?? Amy most definitely embraced simplicity and minimalism. Who were you to define “modern”? I feel you could of stated that in your humble opinion the lack of color isn’t something you prefer. It would of been a bit more of a positive statement. And shown respect to the quilter and her work that she so selflessly is sharing with all of us. I personally feel it is stunning and very refreshing to see a void of bright color quilt. Very unique and very modern. This quilt is stunning! I love everything about it! It has a fresh, contemporary look, but I can see it fitting right in, in a traditional setting….. I think I may just have to make one for myself!! Thanks so much for sharing the pictures…. and for the inspiration!! Amy I love it! I am piecing a low volume with greys and whites and a few off whites- but using a 60* triangle ruler. Not a palette I would normally do either! It’s fun to change things up and get excited! This looks so soft and cozy! Love these quiet colors, like freshly fallen snow. Amy I am loving this quilt, it is simply beautiful!! Wow Amy!! I’ve got to say that this is one of my favorite of all your quilts. It is understated, calm, sophisticated and unbelievably modern. Great job! This is beautiful. I love the subtle design – very calming. Beautiful! I love the use of varying textures as well. And the quilting suits it perfectly. Such a beautiful and striking design. Love it! It looks clean and certainly modern but cozy at the same time. I used a 100% Cotton Hobbs Heirloom. It costs a little more, but it’s worth it. Even so, this quilt was still a little stiff until I washed it. That softens them up SO much. Pellon Bamboo batting is also luxurious has a gorgeous drape. Gorgeous!!!!!! You have inspired me to try this!!! I usually love quilts for their scrappiness and color…but this quilt is by far the most elegant quilt (do those words go together??) ever. Such a beautiful piece. This is SUCH a gorgeous quilt! I am looking to send out a top I’ve pieced for quilting, and am curious what “pattern density” you chose for yours from Sew Shabby Quilting to get this pretty result? I did a pretty big version of that pattern – maybe medium density? I’m sure if you ask Melissa, she’ll remember and know what size it was. Hope that helps? Turned out beautiful! Fantastic job! That is stunning!! I have been wanting a nice white quilt for my bed but i couldn’t figure out what pattern!! I have literally been thinking about it for weeks!! That quilt is so perfect! I love it! i wish there was a bundle to make this quilt! Im not very good at picking colour tones. Your quilt is simply stunning. Another lovely quilt! Love your fabric choice, they make a beautiful modern quilt. I used to get a notification from your blog, but now I don’t get anything. Don’t know what happened. I have to come to your blog to see your works. Absolutely stunning. You turned simplicity & quiet into simply beautiful. 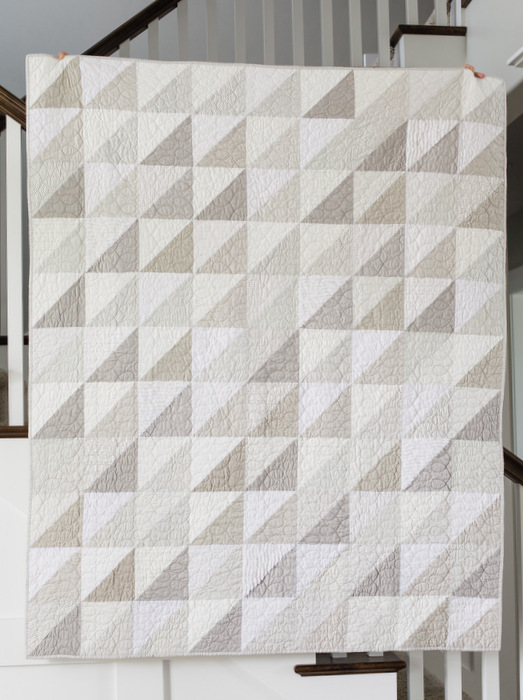 Amy, this neautrally shaded quilt is awesome and my son just asked me to make him a quilt for his living room. He said he wanted it in black and white. Would this pattern work for that or can you suggest a good pattern for a geometric style black and white quilt. (Not sure if shades of black and white are okay, but I’ll ask…..it might depend on the pattern.) Thanks!!! I think Black and White quilts are pretty classic. I’d just search “Black and White Quilts” on Pinterest or Google. I’m sure you’ll come up with TONS of inspiration. You could even have your son do it and it might give him some more direction he wants to go in. I found your blog on crazymomquilts link up. I love your quilt. Would you mind me trying to make one of my own inspired by yours? Would you mind sharing how many different fabrics you use? I saw it was 99 squares. And did u use a lot of the chenille on it? And did thst give you any issue in it? 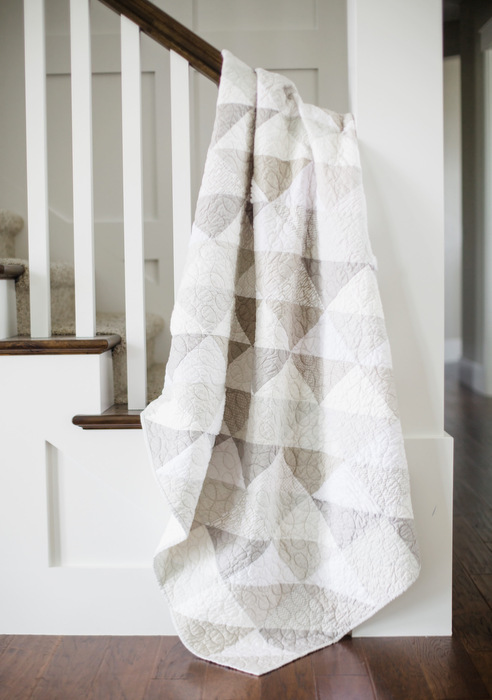 I so love the softness of the whom quilt. What did u do for baking? It is a beautiful quilt again thank you for inspiration and what great photos to show it off..
Sure! It’s such a pretty palette- I think everyone should make one. 🙂 Yes, I used 99 squares. I couldn’t really say how many different fabrics I used – probably about 20? The chenille was something I had in my stash from a long time ago. I tried finding more, but had a hard time. I only used 3 squares – would have loved more. I didn’t have any trouble with the chenille and love the texture it gives. I also found some really pretty, soft, white corderouy that I used a lot of – though it doesn’t show up as much in the pictures. For backing I used a plain, white sheet. The people that this quilt was for wanted simple, so I kept it clean with white. If I was making one for myself, I probably would have used a big pattern, text or something. Have fun! Though I haven’t made a quilt yet, I absolutely fell in love with this quilt. Darn I just ordered store bought grey quilt for my daughter’s college dorm. definitely going to try this. Do you think this would be good for a beginner quilter like me? I do! I think half-square triangles are a great building block. Or you could even just make the same color palette in patchwork squares for even more basic, but equally effective finish. Thanks, still contemplating the on doing the grey one like yours. Stunning. i just wanted to say that this quilt is beautiful. I love the textured fabrics included and think that’d my next quilt. I love your design so much, that I decided to make one for my daughter in the gray scale also. My question to you, is what is the scale size of the D Loop design ? It’s absolutely lovely! Love the quilt. My older daughter asked me to make this for her. I am a confidant beginner quilter. How do I figure out how much fabric I need to make this quilt? 1/4 yards (not Fat Quarters) are a good option for getting yardage for this quilt. If you are careful, you can cut 5 squares 8″ x 8″ from a 1/4 yard. This quilt used 99 8″ x 8″ squares = at least 20 different 1/4 yards of fabric or any combined total to make up 5 yards. If you want to make it bigger or smaller, just figure out your blocks (7″ x 7″ finished) and the same number of 8″ x 8″ squares (or 5 per 1/4 yard). I hope that helps. let me know if you have more questions. Thank you for this post. It was very inspiring. I also loved to learn how you squared up your HST’s. Thank you again. Good question! I added the yardage to the post, since I figured others would have the same question. Here’s the answer: yardage-wise it’s roughly 10 half-yards or 20 quarter-yards (not fat quarters) and 3 3/4 yards for backing. LOVE THIS!!!!! Questio – Did you pre-wash your fabrics first prior to making this quilt since it appears you have a variety of fabric/textures? I saw a chenille, and corduroy and maybe linen or homespun? Or did you wait till after to wash when quilt was finished to have it shrink together? I love this quilt and saw your post a while back and re-discovered in when suggested to me on Pinterest….so I think I need to start doing a fabric search. Thank you! I didn’t pre-wash my fabrics first, but if you’re unsure about your fabrics origin, it wouldn’t hurt to pre-wash them. This quilt is absolutely beautiful! I LOVE the neutral color palette of grays and whites! I’m definitely going to try and replicate it for our mtn cabin; with all the wood tones the gray and white will just add to the relaxed feel. Love it! It is so beautiful… One day, when I have perfected my machine quilting skills, I will make something like this. This is gorgeous. I am planning a similar quilt for my grandmother (she inspired me to begin quilting, so I want to make something special for her). So far, I have only used pre-cut batting for quilts, but I can’t find any similar to the size of your quilt. Did you buy yours in bulk and cut a piece? 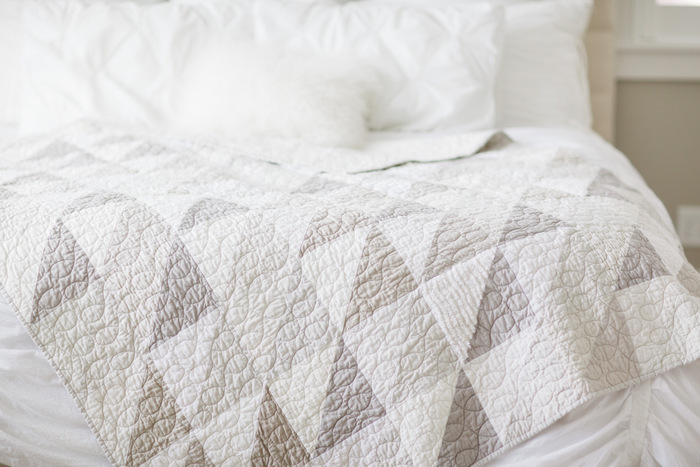 Hi, your neutral quilt is gorgeous.I have only stumbled on this article tonight by accident. I am completely new to quilting, and bought lots of neutral material before Xmas. All off whites, beige and grey, but extremely light, as our house is fairy plain. I have been putting off making the first cuts, but now I have seen such a wonderful finished quilt, I am so eager to start mine. Can’t thank you enough. This is absolutely stunning! I’m enjoying all of the colorful Instagram posts of the Houston Quilt Show this weekend, but was longing to see some quiet sophisticated neutrals. A google search hit upon your blog and this lovely quilt. Well done! I suspect there is a void in the quilting world for a product line of this sort. Thank you so much! I’m seeing a lot more neutral, “low volume” collections coming out from manufacturers like Moda and Art Gallery. I hope you find some good ones! I asked my future daughter-in-law to let me know what colors/style she would like for a quilt. She sent me a picture of your quilt. Thanks so much for the detailed instructions… I’m also enjoying your other posts. Beautiful quilt! But you have a few mistakes in how many squares you need and the yardage needed. If you have 99 squares and you need to match up light and dark that will give you approx. 50 squares to make HST. Once you make the HST you will end up with only 100. You need 198 to make the quilt the size you have shown. So you need a yard of 10 different fabrics or a half yard of 20 different fabrics. Ughhhh, I was so wrong in my above comment! You are right in All your instructions. So sorry! Most of them. There might be a few that are Linen or a cotton/linen blend. Pretty much. A couple might have had some linen in them, but generally speaking they were cotton.